Victoria is ever so posh and stately. 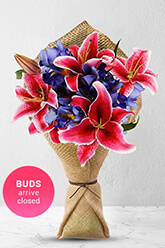 The grand dames of flowers, Oriental Lilies and blue Iris, make this the perfect statement arrangement for special occasions and special people. Lilies may be sent closed/partially closed in order to prevent damage and to last longerVase not included. We would however suggest including a Premium Vase with your gift to make the it that much more impressive. Ordered at 10am online and was delivered at 1.30pm. Recipient was very happy!